Edinson Cavani is out of PSG’s trip to Manchester United this week, and according to the French club’s local media it’s unlikely he’ll be able to feature in the return leg in Paris. 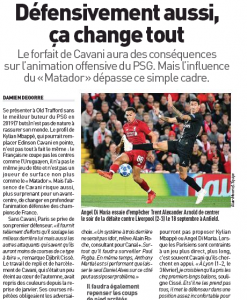 This obviously creates problems for Thomas Tuchel, with Neymar also missing upfront, but L’Equipe explain Cavani’s absence is going to provide a defensive issue on top of the impact it will have in attack. ‘Without Cavani, Paris deprives themselves of their first defender’, explain L’Equipe. Cavani has been pressing hard recently, and that’s resulted in increased interceptions from the player, which have helped breakdown attacks and turn them into threatening positions for PSG. For corners, it’s thought Cavani will be particularly missed defensively against Manchester United. L’Equipe explain he usually has a free role at the front post, which allows him to clear the ball with some regularity. It’s explained he’d already done so in the match against Bordeaux before coming off injured. L’Equipe believe the probable team will be: Buffon – Kehrer, Thiago Silva, Kimpembe, Bernat – Verratti, Marquinhos – Daniel Alves, Draxler, Di Maria- Mbappe. Still not bad, is it? Manchester United certainly shouldn’t be complacent.